The 7 million tourists who visit China’s Forbidden City every year encounter a fascinating question: How did ancient Chinese workers manage to put in place the palace’s iconic 300-ton carved marble slab? Historical accounts about the stone’s transport differ, but researchers at Princeton University and in Beijing have used engineering calculations to set the record straight. They studied how a band of workers could have moved the enormous block of stone from a quarry 70 kilometers (about 43 miles) away to the palace in Beijing by sliding it on a track of wet ice. Once in place, the slab was chiseled into an intricate design known as the Large Stone Carving. Howard Stone, a professor of mechanical and aerospace engineering at Princeton, and colleagues in Beijing are the first to investigate the technical details of the transport of the stone. Their research shows that the ancient Chinese pulled the stone for the carving on a wooden sledge sliding on an ice path, and that they likely used water as a lubricant on the path. Contrary to the popular tale of 20,000 men dragging the stone to the palace, they estimate that this transport would have allowed a team of about 100 people to accomplish the feat. Their results were published Nov. 4 in the Proceedings of the National Academy of Sciences. Numerous heavy stones were brought from nearby quarries to construct the Forbidden City, China’s largest imperial palace, between 1406 and 1420 AD. Among them was the Large Stone Carving, which originally weighed approximately 300 tons; its weight was brought down to about 200 tons when it was re-hewn in 1761. Guidebooks, tour guides and signs at the Forbidden City all tell the same story: It took 20,000 men 28 days to haul the stone from the quarry to the palace site. They did it in deep winter, digging wells every half a kilometer (1,650 feet) along the route, and pouring well water on the ground to make an ice path. This story puzzled Stone when he visited the Forbidden City in the summer of 2012. His puzzlement came from a common belief in mechanical engineering that there were no known examples of men hauling heavy stones using sledges in ancient China because the spoked wheel appeared in China in 1500 BC. With Stone were Jiang Li, a professor of mechanical engineering at the University of Science and Technology Beijing, and Haosheng Chen, a tribology professor at Tsinghua University. Tribology is the science of interacting surfaces in relative motion, and includes the study of friction and lubrication. “We were all together, Jiang and Haosheng the tribology experts, standing in front of this massive rock and wondering how on earth it got there,” said Stone. A few questions immediately arose in the researchers’ minds. Why was a sliding sledge used to pull the carving when wheels had existed for 2,000 years? And was it better than other ancient techniques such as sliding on wood or using log rollers? “In tribology, rolling is usually considered a superior system over sliding,” Li said. They also wondered about other details of the transportation. Chen and Li started by translating books about the history of technology in China that were available in libraries. 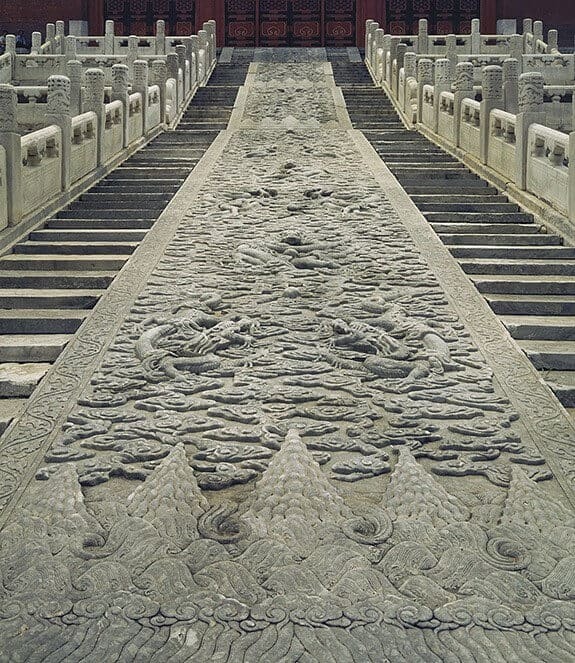 They were not able to find any historical record of the transportation details of the large stone carving. But one 500-year-old document, the “Liang Gong Ding Jian Ji,” stated that in 1557 a 123-ton stone was transported over 28 days. The team used this stone as a reference for their calculations. The text revealed that while both sledges and wheeled vehicles were used to transport heavy stones to the palace, sledges were safer and more reliable for stones heavier than the 95-ton capacity of the mule-driven vehicles of the time. The team deduced that rolling the stone on logs would not have been practical given the long, likely uneven path. Freezing winter conditions in the region made it more practical to pull the sledge on hard, flat ice. They calculated transportation speed by dividing the 70-kilometer distance by the hours it took to move the stone. “We know what time of year it was moved so we could look up how many hours of daylight there were in 28 days,” Stone said. The speed came out to a low 8 centimeters (3.2 inches) per second. At that speed, the team calculated, friction would not be enough to melt the ice and provide water film for lubrication. “While we can’t prove this detail, it’s likely that they poured water on the ice path as a lubricant to actively lubricate the sliding surface,” he said. Finally, by estimating the force spent by a single person, the researchers could calculate how many men would have been needed to pull the carving. For the 123-ton stone, they found that only 46 people could have pulled the stone on a water-lubricated ice surface, while 338 people could have done it without lubrication. Scaling up these numbers results in an approximately 100-men-strong team for the Large Stone Carving. The work was supported by the National Natural Science Foundation and the Fundamental Research Funds for the Central Universities of China.